Single dwelling buildings are most cost and energy efficient when the longest walls are oriented along a north-south axis and when the length of east and west walls is minimised. However, it is still possible to design a house with good thermal performance even if a precise northern orientation is not possible, and with different shaped buildings. Orientations of up to 20° west of north and 30° east of north will still allow good passive sun control, by allowing standard eaves overhangs to admit winter sun to heat the building but exclude summer sun, with no effort from the occupants and no additional cost. Reasonable solar benefits can be achieved in almost any situation with good design. An important aspect of any assessment is ensuring the roof colour is accurately selected. If the roof colour is not nominated on the drawing set or specifications, then the NatHERS Technical Note provides direction on defaults values. However, if the roof colour is noted, then a number of product manufacturers provide listings of the solar absorptance of their products and whether they are considered light, medium or dark for both BCA and BASIX classification. For example, Colorbond and roof tile solar absorptance on the BlueScope http://steel.com.au/products/coated-steel/colorbond-steel/basix-and-bca-classification and Bristile Roofing website https://bristileroofing.com.au/nsw/solar-absorption. Creating and attaching an eave to an external wall is relatively straightforward in FirstRate5. So let’s see if you can correctly answer the following question; If you create a 600mm eave projection to an uninsulated 250mm brick veneer wall, then to achieve minimum regulatory compliance, you add R2.5 bulk insulation that fits uncompressed within a 90mm timber stud – does FirstRate5 still think the projection is 600mm? If you are not sure of the answer, try it! The Calculated Tab introduced in FirstRate5 provides a convenient way to toggle on and off the visual display of eaves and wing walls on the drawing canvas. When learning the software, students have reported that the display of calculated wing walls can be distracting. In this scenario, considering unchecking the wing walls option during data entry and then enable once complete to check and adjust the wing walls accordingly. The eaves option is very useful because the effective eave is now clearly shown. An angled eave, i.e. an eave not parallel to the wall will be shown as a grey dashed line. Note the effective eave in this instance, is a line parallel to the wall at the furthest projection point, so remember to manually enter a suitable average projection. If the projection has a manual override, i.e. a manual adjustment via Edit Eave, the effective eave will be shown as a pink dashed line. Hopefully this visual clue aids in accurately defining an eave and serves as a reminder that eaves are always parallel to the attached wall. Being able to work quickly and efficiently is important for an Assessor, especially as more time should be allocated to project optimisation, compared to data entry. One area a FirstRate5 user can save time is the Project tab. 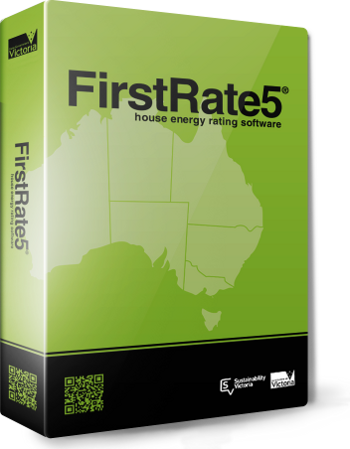 Unlike other NatHERS software where you can save and load certain information, or the software automatically populates the key construction and insulation materials section, FirstRate5 users currently need to enter information manually. If you are engaged in repeat work, consider creating a FirstRate5 file containing common project information and then save as a pseudo ‘template’. Then use a copy of the saved FirstRate5 file before starting a new project then add any unique project information. For example; if you are working for a repeat client, complete the client details section, or if the client uses the same specifications for each project, complete the key construction and insulation materials section – just remember to update the information if the specifications change.